Naked cakes have been a popular trend over the last 5 years. 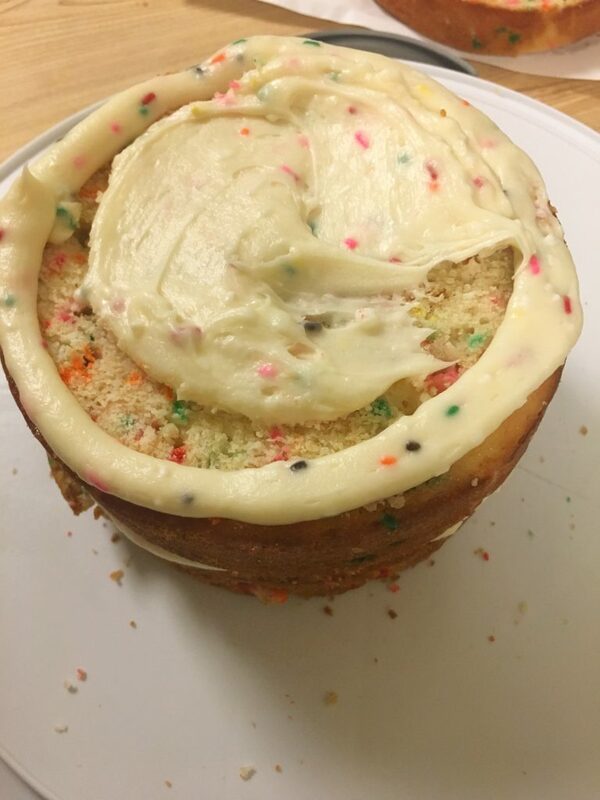 Naked cakes are cakes with only icing on top and no icing on the sides. It is what the cake looks like before the baker adds icing to the sides. One thing I like about naked cakes is it has less icing! 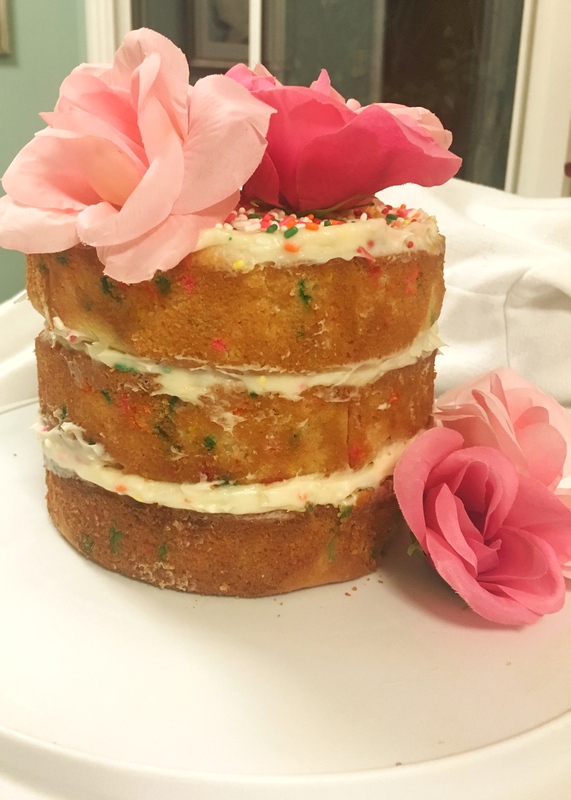 Naked cakes are being seen at more weddings and birthday parties. 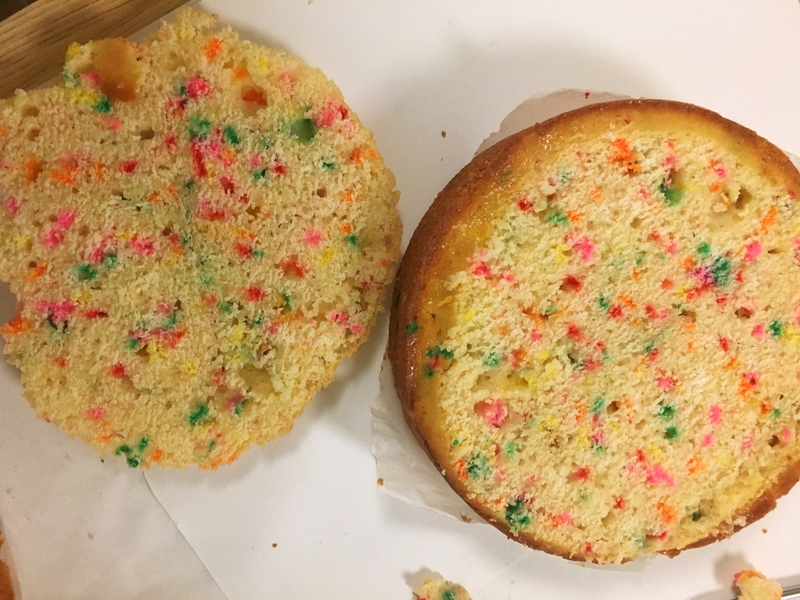 The cake with just the icing in the middle gives a new style to the traditional layered cake that we’ve seen for decades. I attempted my first naked cake in honor of a very good friend. 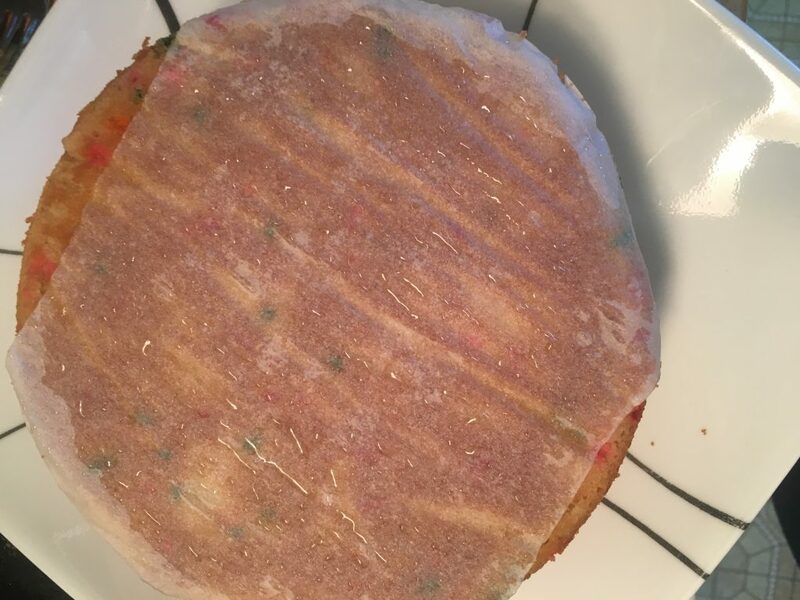 My friend is getting ready to celebrate her daughter’s first birthday and she asked me about making a naked cake. I gave her some instructions and sent her a video that I found on YouTube. Then realized that I would be better able to help her make this cake if I tried one myself. I’ve made tiered cakes in the past but I’ve never done one without icing on the sides. Putting together the cake was quite easy and a lot less stressful. I didn’t have to make a ton of icing or have to worry about the icing being smooth and even on the sides. A couple of things to be aware of when making a naked cake. First, you can make this cake in ANY size. Just make sure you are putting the right amount of batter into the pans. 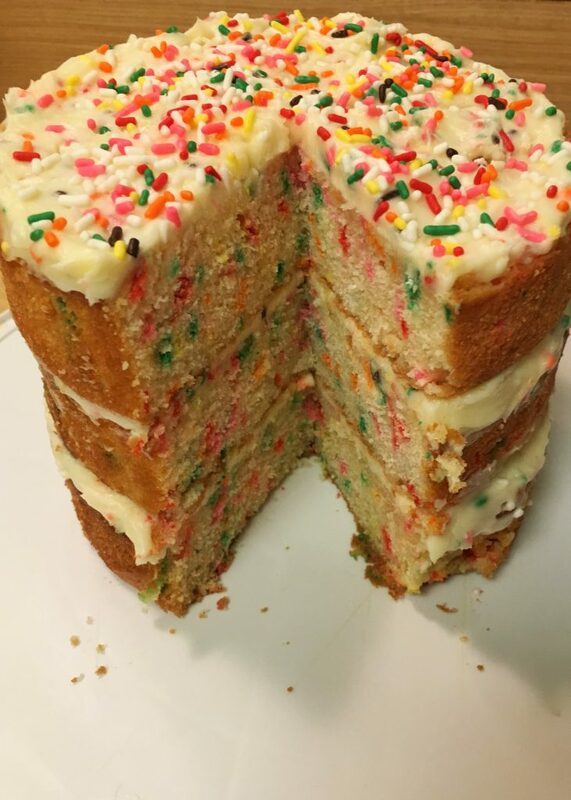 For a 3 tiered 6 inch cake, I used 2 cups of Funfetti batter per pan. 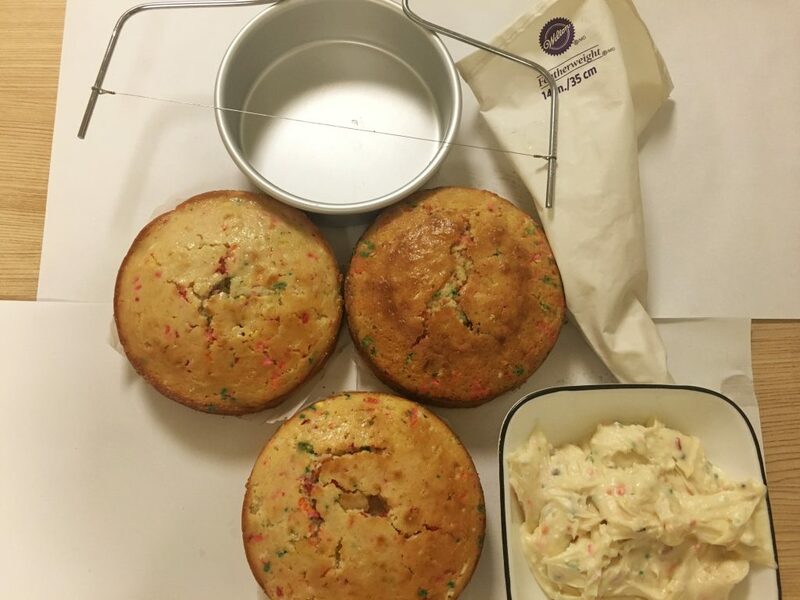 Most cake recipes make 6 cups of batter. Please use this very helpful Wilton Guide to know how much batter you need per pan size. Make cake batter per instructions. Wipe the pan with cooking spray or vegetable oil. Add parchment paper to the bottom of the pan. This will allow for easy removal. After the cake has finished backing. 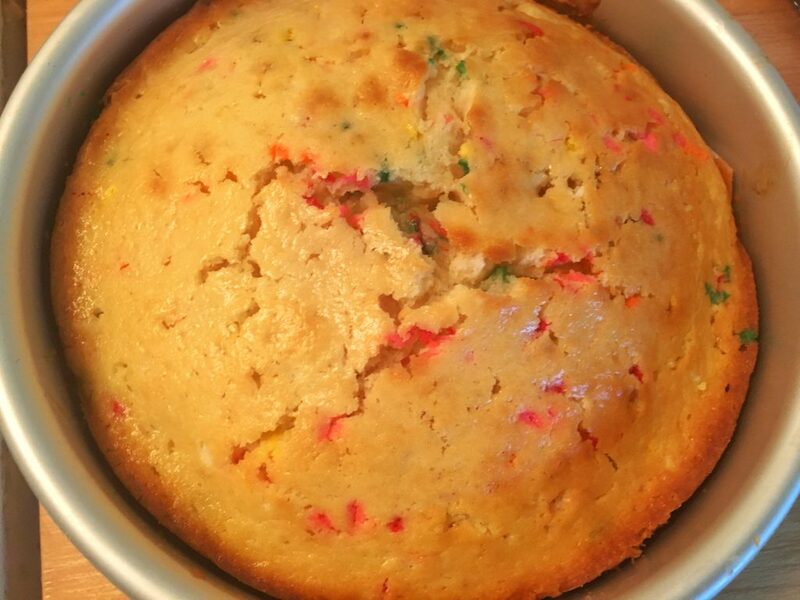 Use a butter knife, go around the edge of the pan to make sure the cake is not stuck. Tip the cake pan upside onto a plate. The cake should come right out of the pan. Using another plate put the cake right side up. Be very careful doing this, the cake is still hot and could break. Let the cake cool for at least 4 hours. Repeat for each cake. Once cakes have cooled, make the icing. If you need any icing recipes, please check out my Buttercream and Cream Cheese icing recipes. 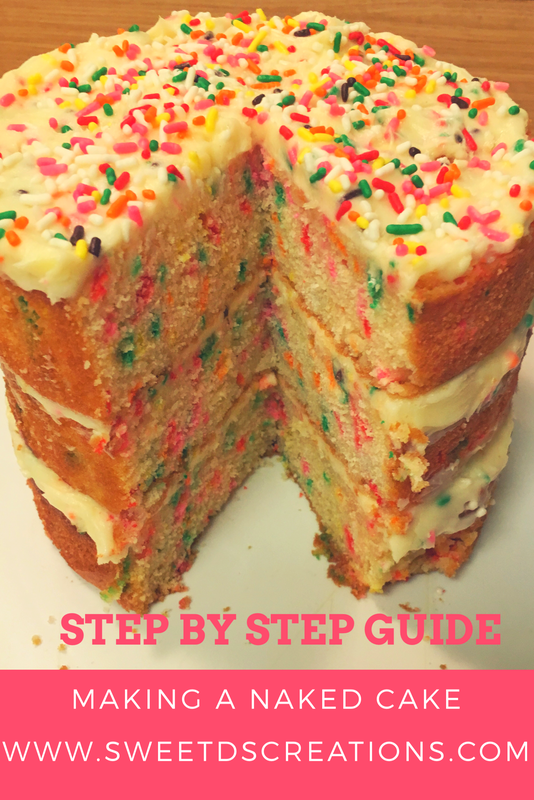 Remove the tops of each cake using a Cake Leveler or a knife. 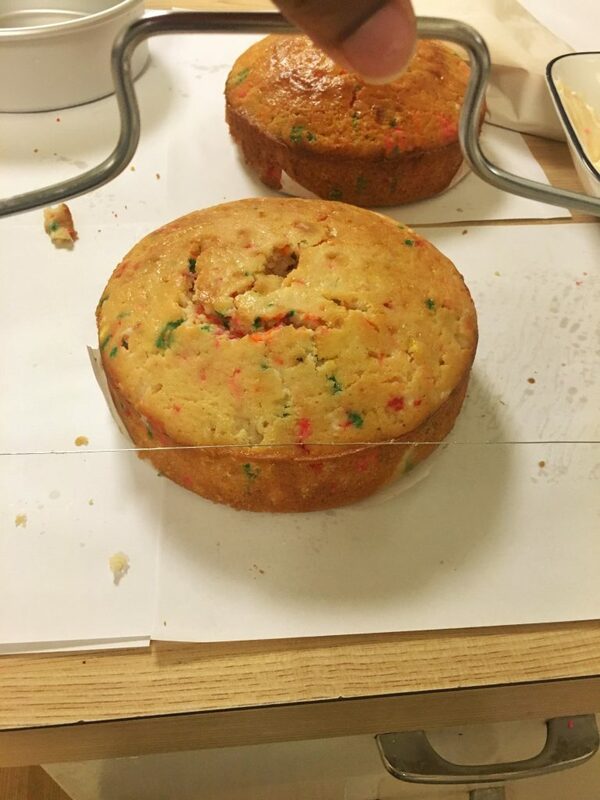 Make sure the cakes are flat on top. It’s time to build our cake. Go around each layer of the tip with icing in a piping bag using a 2M tip. This will give you a nice border to follow while icing your cake (If you don’t have a tip or piping bag you can skip this step, just be careful when spreading the icing). Then spread icing around the top of the cake. Add 2nd cake, repeat Step Five. Add 3rd layer, repeat Step 5. Decorate the top of your cake and enjoy. I used sprinkles and pink roses on the top. This looks delicious and really cute. I’m a at snatching your recipe! Wow, that looks delicious, For sure I will try soon Thanks for sharing. Yes. Not too much icing! One thing I like about naked cakes is that you can (depending on the cake) really understand the construction and physics behind baking and construction of cakes. Often you can never really see how they’re constructed as it’s under lashings of icing! 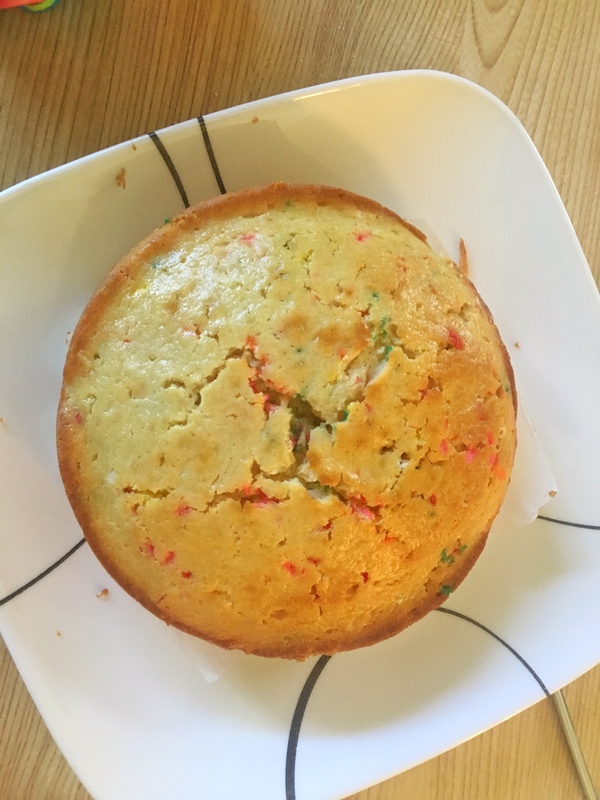 Wonderful post- and also I now have a funfetti recipe to hand! Never tried a Naked Cake, but this looks very easy and hassle free. Will try this for sure. Thanks for sharing this post. I tried a naked cake a couple week ago. I tried to cut one cake into halves, but I had a hard time making a clean straight cut (I used a long bread knife). 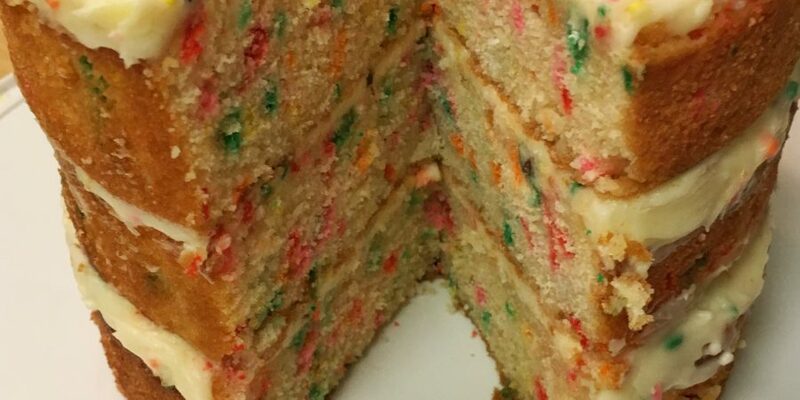 I see you used an entire cake for one layer. Any advice? I recommend using a cake leveler. It allows you to cut the cake evenly. I use this to cut the tops off of my cakes. Let me know if that works better than a bread knife.